I’ve made another one. I just couldn’t help myself. When I make one, I think of all kinds of ways to do it better and so have to make a few more. That is why I am so often doing my artwork in series. working drawing on the right. 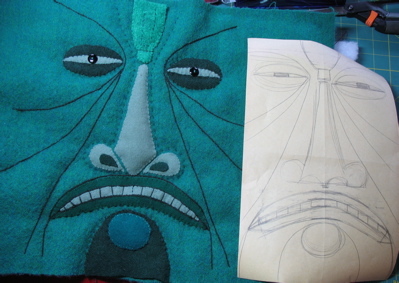 My tiki face, flat, on the left. I embroidered the features and stuffed the nose like last time. But this time, I used a piece of thick quilt batting behind the fabric. I did a running (hand quilting?) stitch around the features and now they have a bit of puffiness. I didn’t use the pillow insert this time. I stuffed him with wool scraps and poly stuffing. He has got a nice heft to him. He’s slightly taller then 14 inches and about 6 1/2 inches across. Here is a close-up to show some of the embroidery. It started to rain just as I went out to take photos. These aren’t too bad though. I kept thinking of the old Jolly Green Giant commercials when I was sewing him up! And speaking of green… did you see Ellia‘s posting about dreams (versus reality, I guess)? I loved it. I remember my college interview, so many years ago. The woman who interviewed me asked what I saw myself doing, 10 years in the future. The question came as a shock to my 17 year old self. Growing up in a time of constant nuclear fear/threat, I don’t think I really believed in 10 years away. I told her I could see myself in my own shop, selling my work, whatever I was doing at that point… sound familiar Ellia? Anyway, fast forward to now. I was thinking only recently about how Etsy has given me that little shop, a place to sell the stuff I make. Funny really. This entry was posted in doll, finished projects, General, personal by mimik. Bookmark the permalink. wow! 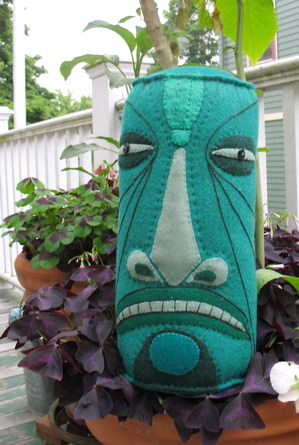 these tikis are so cool. i LOVE them! Loooove this guy! You must put some magic in everything you do because he is enchanting! I love this pillow and your post cards as well. Your work is fantastic. 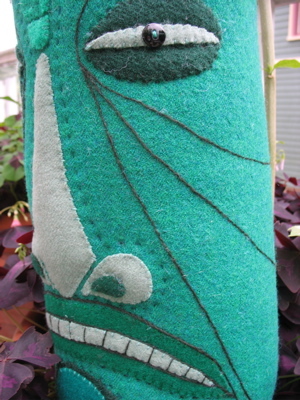 I love the green version and the anticipation of a whole series of these tikis. I love these new cushions and I bet my teenage kids would as well. As for dreams, I must have been a weird kid because I never had any dreams of what my adulthood would be. I wish I had because maybe I would have known what I wanted to do as an adult. Not to say I didn’t live in a fanasty world every time I went to see a Tommy Steele musical but that is a very different thing. The green tiki made me gasp. He is gorgeous! Your work is so superb, and such an inspiration. Thanks for sharing it all.